With gardening comes routine jobs that are fun at first, but they might get a bit boring for kids with time. 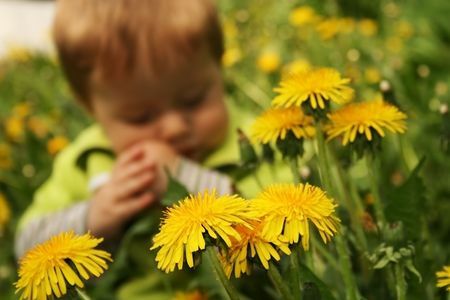 As Flower Rangers, set your kids loose to eradicate the dandelion interlopers, stat! Your challenge as head gardener is to keep that interest level high with a combination of education, learning games, and contests. Gardening games can help achieve all three of these goals. Here are 17 gardening games for kids that do double duty as ways to improve your garden. Let the learning games - and the fun! - begin. Gardeners define a weed as any plant in the wrong place. Roses can be weeds if they are invading your watermelon patch. Weeds are bad because they steal nutrients that our flowers and veggies need. Set up an adversarial relationship with weeds as one of the garden games for kids. They are "invaders" and must be eradicated. 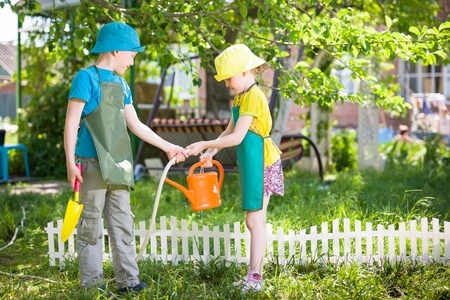 Start a contest as part of your gardening with kids: Who can pull the most weeds each week? The winner gets to pick a movie to see. And the reward for a morning of weeding? A rain dance in the sprinkler! Kids like to play in water. Buy a watering wand or a nozzle with several settings. Show the kids how to set it on a shower setting so they don't wash the plants away with a powerful jet of water. Set a timer and see who can collect the most snails (or slugs) in 10 minutes. This is a good game for dusk when the little slimy creatures come out for a snack. Or you could make it even more fun and do it by flashlight. To keep annuals blooming, you have to cut or snap off spent blossoms. This is a very fun task for kids, and it's also one of the learning games that instills one of the essential gardening basics. Aphids are those little black, green, or white bugs that swarm your prize roses and leave nothing in their wake. What could be more fun than learning games that allow kids to get rid of the bad guys with Mom's approval? After all, this is one pest you'll want to remove - stat! The best way to get rid of these little pests is just to wash them away. Turn the nozzle of your hose on "jet" and take aim! The first kid with an aphid-free rosebush wins! Leave a damp newspaper rolled up in the garden. Earwigs crawl in. You throw it away. 'Nuff said. This one is not for the squeamish. Put a board about an inch off the ground. Snails will crawl under it for shelter. See who can trap the most. Plant bulbs in a pattern that spells out your kid's name or initials. For best results, plant on a hillside or in an area that can be viewed from above, such as a second-story window. Arrange three poles in a teepee shape and plant fast-growing vines such as nasturtiums or morning glories at the bottom. In a couple of months, she'll have a leafy tent. You can even plant baby's tears inside to form a "carpet". Harvest edible flowers and freeze them in ice cubes for conversation "ice breakers" at your next party. Growing gourds can be a lot of fun if you have a long growing season (at least 120 days of sun). After the gourds dry out, you can carve them, make birdhouses out of them, or even paint faces on them. Plant pumpkins and when they are about the size of a baseball, help your child write his name on one. Then take a paper clip and punch shallow holes along the name. When the pumpkin is ready to harvest, you'll know whose is whose. The name will be visible in a hue lighter than the pumpkin skin. This is a little wacky but fun. Plant cucumber seeds. When the cucumbers are about an inch long, slide one into the bottom of a plastic bottle. (Keep it shaded or else it will cook). When the little cucumber grows up, take off the vine, bottle and all. You'll have the horticultural equivalent of the ship in the bottle. At the end of the summer, let the kids go around collecting seeds from spent flowers and vegetables. Help them put label seeds and dry them. Then put the seeds in paper (not plastic) bags and label the bags. Next summer, they have their own stash of seeds to plant. You could also talk to them about the different kids of seeds and discuss why some are shaped differently. Who knew learning games could be so much fun? !